AMR is an abbreviation for Adaptive Multi-Rate Audio Codec. It is a technology that utilizes audio compression formats primarily for speech. A typical AMR speech codec will have a multi-rate of eight bitrate values that range from 4.75kb/s to 12.2 kb/s. The structure of AMR allows the creation of a group of 160 twenty millisecond long samples by the codec in one frame. The multi-rate codec available for normal AMR files include ACELP, DTX, CAD and CNG. In addition to compressing speech, the AMR file format can also be used for the storage of spoken audio using the same codec. There are a number of modern telephones that has the capability to store short audio recordings using the AMR format. There are also other programs, both free and proprietary that can be used to convert files from this format to other various formats and vice versa. However, since AMR file format was initially designed for storing speech or audio recordings, quality is likely to be compromised if other media files are converted into AMR. Though AMR file format was not designed for music and videos, there are certain instances when you might come across them and be confused on how to open them. The fact is that it is still possible to open AMR files with your personal computer, tablet, Smartphone or other devices. In the case of a PC, the easiest way to open such a file is to simply double-click on it then allow the PC to decide which the most appropriate program to open it is. If the already installed programs in your computer are unable to open the file, then the other alternative would be to search and download an appropriate AMR player. There are several sources from the internet that you can get such media player for absolutely free. If you prefer this route however, you need to be cautious and ensure that you don't download a program file that will hurt your computer. Ensure that you download the program from a trusted website. This is the only to avoid downloading viruses, spyware, malware and other malicious programs that might compromise the safety and security of your computer. The first option is to use various websites that offer such conversion services. There are so many of them offering the services for free and all you have to do is to simply choose the ones that suits you the most. The process will in most cases involve three simple steps: upload the AMR file, choose the format you want it converted to then download the converted file. Some sites will require you to give your email address so that they send to you the converted file to your inbox. It is up to you to choose to whether or not to give your email address. But the best alternative would be to download the AMR converter from http://www.mystikmedia.com/amr_converter.htm and install it in your computer so that you can use it whenever you want. This trusted software has been specifically designed for the purposes of converting AMR files to other file formats. It can convert any AMR file or its variation to more than thirty different formats including FLV, MP3, MP4, WMA, WAV, AVI etc. The software is fairly intuitive with lots of features to enable you have a very good experience with it. It converts faster and can allow you to batch convert. Though it is not available for free, it's well worth its cost with all the features and flexibility it will give you in converting your AMR files. 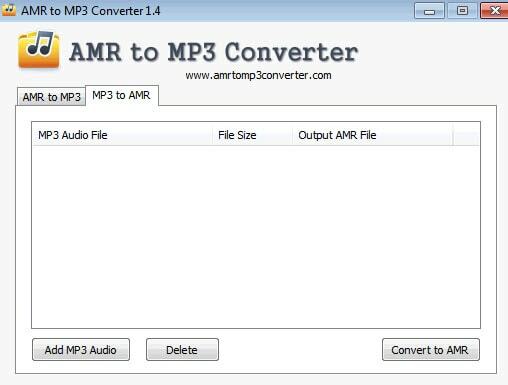 Free AMR to MP3 Converter – this is a desktop software program that has been designed to convert AMR files to MP3. It has a simple and intuitive interface and it allows for the conversion of single as well as group conversion of files. Other than slowing down some computers, the converter doesn't seem to have any other drawbacks. Wondershare Filmora – this is a full featured video and audio converter. Other than allowing you to convert AMR files to any desired format, it also enables you to edit the file. Converting files with it is as easy as dragging and dropping files from one format to the other. The fact that it is available for both windows and Mac makes it accessible to very many users. Apowersoft Free Online Audio Converter – Apowersoft Free Online Converter is a web based service that lets you convert AMR files to MP3 as well as other formats like WMA, WMV, FLAC, OGG, RA and AAC. It offers an intuitive user interface with a fast conversion process since it does not upload the AMR files to the servers before converting them. Freestar Free AMR MP3 Converter – this is another online service that lets you convert the poor quality AMR files to high quality MP3 files. As opposed to most of the online converters, this particular one allows you to convert multiple files at a time. It also comes with a number of features including certain advanced options to give you the ultimate power to control the whole conversion process so that you get the desired quality.